Picture yourself on a warm summer’s day, sitting in the grass in the shade of a beautiful oak tree and listening to the rustle of the leaves. Does this scene appeal to you? Then you may want to thank a squirrel. The majority of hardwood trees that aren’t planted by humans are planted by squirrels. 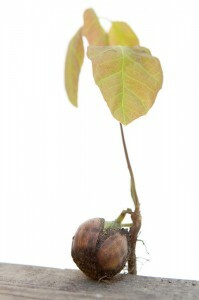 An acorn from an oak tree can’t sprout if it’s just lying on the ground. It has to be buried in the soil. Every fall in an oak forest, the trees produce thousands of acorns that fall to the ground. The squirrels then get busy burying them in the ground for the winter. These squirrels will bury nuts in hundreds of different locations, and research has shown that they use their amazing memory to locate them later. Even though squirrels can remember the location of hundreds of cached nuts, inevitably a few acorns will be forgotten and will sprout into the next generation of oak trees. This ensures the renewal of the forest, and the very trees the squirrels depend on. This entry was posted in Fun Squirrel Facts. Bookmark the permalink. At my job, I was asked to go out into the planting strips in the parking lot, and get rid of anything the gardeners hadn’t planted. I pulled a lot of weeds, but I also found oak tree seedlings, I looked around and didn’t see another oak tree on the block. I have no idea how far the squirrels transported those acorns, but there were lots of them! I took one home, potted it in a clay pot in my apartment. I have an oak tree growing by my window. I’ve had it for a couple of years now. It needs more light than it’s getting, but it does grow.